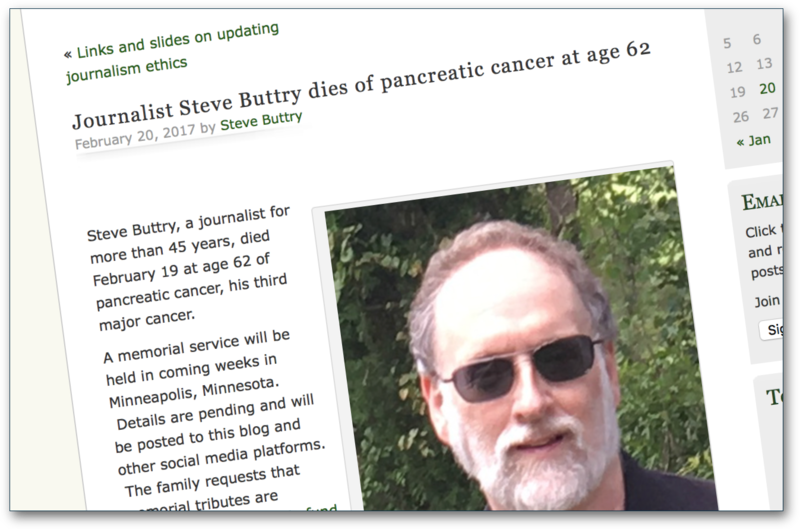 Steve Buttry, a journalist for more than 45 years, died February 19 at age 62 of pancreatic cancer, his third major cancer. If you’re not familiar with Steve, he was one of the most prominent voices exploring the role of digital in reshaping newsrooms, through both his work for the last decade or so and through his blog, The Buttry Diary. I can’t claim to have known Steve (the Venn diagrams of our worlds clearly overlapped, but we were never really in each other’s orbit), but I am deeply familiar with his work. Buttry visited the newsrooms of all DFM daily newspapers, visiting some of them in multiple locations as newsrooms moved as well as some weekly newsrooms. In all, he visited 84 DFM newsrooms, leading workshops for staffs as well as coaching editors and other staff members. Two primary focuses of his work at DFM were training new editors in leading Digital First newsrooms and “unbolting” newsroom culture from the newspaper factory model. The DFM experience ended when the hedge fund that controlled DFM, Alden Global, changed its strategy. Buttry’s job was cut April 2, 2014, along with other members of the company’s Thunderdome newsroom. Brady and Paton eventually left DFM as well. For the last few years, Steve taught at Louisiana State University. Friends and colleagues are building a scholarship fund in his name. When he announced he had been diagnosed with pancreatic cancer, I couldn’t help but shudder. I know from my own Dad’s death from it back in 2001 that, for most people, it’s a short-term death sentence. He did well to delay his passing for seven months. With Steve’s passing, it feels like another of the elder statesmen of the online journalism discussion has been silenced. Romenesko has retired, Buttry has passed. But, true to his vision, Buttry has left behind his wisdom in digital form, even blogging his own obituary, creating that rarest of things, a blog that ends, rather than peters out.